After a break from Academia on compassionate grounds I switched to Developmental Biology when starting a PostDoc in the lab of Dr. Kristen Panfilio at the Cologne University in Germany. 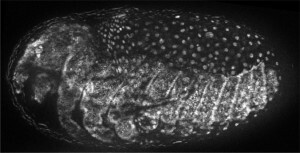 Here, I work on the developmental role and the evolution of extraembryonic epithelia (or membranes) in insects. These are essential for proper development, but do not contribute to the tissue of the embryo. By knocking down various genes and observing the resulting phenotype we can assess their functions in development and their position and interactions in gene regulatory networks. Besides standard methods like in situ hybridization, q-PCR or cuticle preparation, long term live imaging has been proven to be extremely informative, as it enables the identification of transient phenotypes as well as changes at the tissue or cell level. As we pointed out, a wide range of methods used to investigate the function of a given gene is important to integrate across multiple levels in biological organization, which then allows comparing between different species. Our group works mainly on the Red Flour Beetle Tribolium castaneum. Its extraembryonic membranes, the amnion and the serosa, perform a variety of movements, sometimes together, sometimes separate, but always well-coordinated both, between the membranes themselves, but also with the embryo. My currently main focus lies on the gene Dorsocross. 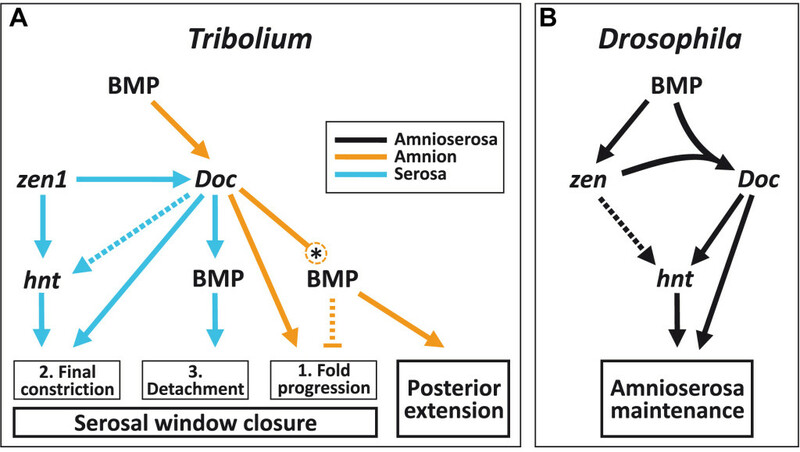 It is a transcription factor and controls all major morphogenetic events in Tribolium extraembryonic development; it is important for the early fusion and detachment of the membranes, for later rupture and withdrawal and finally for dorsal closure, which requires strict coordination between extraembryonic membranes and the embryonic flanks. From an evolutionary viewpoint, Dorsocross is also very interresting. 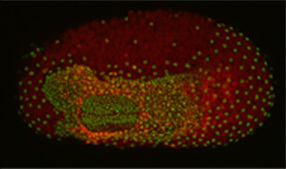 Comparing the function of this transcription factor between Tribolium and the fruit fly Drosophila melanogaster, we observe a shift of not only extraembryonic to embryonic, but also from morphogenetic to specification and maintenance functions.